Solar Energy Advantages are often discussed in the news, the biggest advantage may be that this is an option to achieve energy independence on an individual basis and at your own speed. You can add a solar powered attic fan or water heater or migrate a little faster with solar panels to supplement a portion of your electrical needs or get completely off the grid or somewhere in between. You have the flexibility of transitioning to solar energy as your budget allows. Why transition to solar at all? Relying on the electric company for our electricity has been convenient. What we didn’t realize or didn’t want to know was what the energy companies needed to do in order to supply our growing needs. Maybe we would have made different choices on how we used electricity, maybe we would have wasted less if we had known what it really cost us. We took for granted that electricity would continue to be easy to acquire, relatively cheap to consume and reliable. While it is still convenient, we know it is no longer easy to acquire or cheap to consume and in the past few years many of us have experienced rolling blackouts, power outages that lasted longer than a few days and these instances are happening multiple times and more regularly. Taking into consideration the environmental disasters of oil spills in just Alaska and in the Gulf, it’s clear that oil companies have no backup plan in the case of mishap. Now maybe the best time to really explore the advantages of solar energy and how to transition to this source of energy for our homes and businesses. Now may be the perfect time to to begin exploring your own solar energy advantages. The Earth receives 174 petawatts (PW) of incoming solar radiation (insolation) at the upperatmosphere. Approximately 30% is reflected back to space while the rest is absorbed by clouds, oceans and land masses. The spectrum of solar light at the Earth's surface is mostly spread across the visible and near-infrared ranges with a small part in the near-ultraviolet. Earth's land surface, oceans and atmosphere absorb solar radiation, and this raises their temperature. Warm air containing evaporated water from the oceans rises, causing atmospheric circulation or convection. When the air reaches a high altitude, where the temperature is low, water vapor condenses into clouds, which rain onto the Earth's surface, completing the water cycle. The latent heat of water condensation amplifies convection, producing atmospheric phenomena such as wind, cyclones and anti-cyclones. Sunlight absorbed by the oceans and land masses keeps the surface at an average temperature of 14 °C. By photosynthesis green plants convert solar energy into chemical energy, which produces food, wood and the biomassfrom which fossil fuels are derived. From the table of resources it would appear that solar, wind or biomass would be sufficient to supply all of our energy needs, however, the increased use of biomass has had a negative effect on global warming and dramatically increased food prices by diverting forests and crops into biofuel production.As intermittent resources, solar and wind raise other issues. Average insolation showing land area (small black dots) required to replace the world primary energy supply with solar electricity. 18 TW is 568 Exajoule (EJ) per year. Insolation for most people is from 150 to 300 W/m² or 3.5 to 7.0 kWh/m²/day. Solar energy refers primarily to the use of solar radiation for practical ends. However, all renewable energies, other than geothermal and tidal, derive their energy from the sun. Darmstadt University of Technology inGermany won the 2007 Solar Decathlon inWashington, D.C. with this passive housedesigned specifically for the humid and hot subtropical climate. The common features of passive solar architecture are orientation relative to the Sun, compact proportion (a low surface area to volume ratio), selective shading (overhangs) and thermal mass. When these features are tailored to the local climate and environment they can produce well-lit spaces that stay in a comfortable temperature range. Socrates' Megaron House is a classic example of passive solar design. The most recent approaches to solar design use computer modeling tying together solar lighting, heating and ventilation systems in an integratedsolar design package. Active solar equipment such as pumps, fans and switchable windows can complement passive design and improve system performance. Urban heat islands (UHI) are metropolitan areas with higher temperatures than that of the surrounding environment. The higher temperatures are a result of increased absorption of the Solar light by urban materials such as asphalt and concrete, which have lower albedos and higher heat capacities than those in the natural environment. A straightforward method of counteracting the UHI effect is to paint buildings and roads white and plant trees. Using these methods, a hypothetical "cool communities" program in Los Angeles has projected that urban temperatures could be reduced by approximately 3 °C at an estimated cost of US$1 billion, giving estimated total annual benefits of US$530 million from reduced air-conditioning costs and healthcare savings. Agriculture and horticulture seek to optimize the capture of solar energy in order to optimize the productivity of plants. Techniques such as timed planting cycles, tailored row orientation, staggered heights between rows and the mixing of plant varieties can improve crop yields.While sunlight is generally considered a plentiful resource, the exceptions highlight the importance of solar energy to agriculture. During the short growing seasons of the Little Ice Age, French andEnglish farmers employed fruit walls to maximize the collection of solar energy. These walls acted as thermal masses and accelerated ripening by keeping plants warm. Early fruit walls were built perpendicular to the ground and facing south, but over time, sloping walls were developed to make better use of sunlight. In 1699, Nicolas Fatio de Duillier even suggested using a tracking mechanism which could pivot to follow the Sun.Applications of solar energy in agriculture aside from growing crops include pumping water, drying crops, brooding chicks and drying chicken manure. More recently the technology has been embraced by vinters, who use the energy generated by solar panels to power grape presses. Daylighting features such as this oculusat the top of the Pantheon, in Rome, Italy have been in use since antiquity. The history of lighting is dominated by the use of natural light. The Romans recognized a right to light as early as the 6th century and English law echoed these judgments with the Prescription Act of 1832. In the 20th century artificial lighting became the main source of interior illumination but daylighting techniques and hybrid solar lighting solutions are ways to reduce energy consumption. Daylighting systems collect and distribute sunlight to provide interior illumination. This passive technology directly offsets energy use by replacing artificial lighting, and indirectly offsets non-solar energy use by reducing the need for air-conditioning. Although difficult to quantify, the use of natural lighting also offers physiological and psychological benefits compared to artificial lighting. Daylighting design implies careful selection of window types, sizes and orientation; exterior shading devices may be considered as well. Individual features include sawtooth roofs,clerestory windows, light shelves, skylights and light tubes. They may be incorporated into existing structures, but are most effective when integrated into a solar design package that accounts for factors such as glare, heat flux and time-of-use. When daylighting features are properly implemented they can reduce lighting-related energy requirements by 25%. Hybrid solar lighting is an active solar method of providing interior illumination. HSL systems collect sunlight using focusing mirrors that track the Sun and use optical fibers to transmit it inside the building to supplement conventional lighting. In single-story applications these systems are able to transmit 50% of the direct sunlight received. Solar lights that charge during the day and light up at dusk are a common sight along walkways. Although daylight saving time is promoted as a way to use sunlight to save energy, recent research has been limited and reports contradictory results: several studies report savings, but just as many suggest no effect or even a net loss, particularly when gasolineconsumption is taken into account. Electricity use is greatly affected by geography, climate and economics, making it hard to generalize from single studies. Solar water heaters facing the Sun to maximize gain. As of 2007, the total installed capacity of solar hot water systems is approximately 154 GW.China is the world leader in their deployment with 70 GW installed as of 2006 and a long term goal of 210 GW by 2020. Israel and Cyprus are the per capita leaders in the use of solar hot water systems with over 90% of homes using them. In the United States, Canada and Australia heating swimming pools is the dominant application of solar hot water with an installed capacity of 18 GW as of 2005. Solar House #1 of Massachusetts Institute of Technology in the United States, built in 1939, used seasonal thermal storagefor year-round heating. Deciduous trees and plants have been promoted as a means of controlling solar heating and cooling. When planted on the southern side of a building, their leaves provide shade during the summer, while the bare limbs allow light to pass during the winter. Since bare, leafless trees shade 1/3 to 1/2 of incident solar radiation, there is a balance between the benefits of summer shading and the corresponding loss of winter heating. In climates with significant heating loads, deciduous trees should not be planted on the southern side of a building because they will interfere with winter solar availability. They can, however, be used on the east and west sides to provide a degree of summer shading without appreciably affecting winter solar gain. Small scale solar powered sewerage treatment plant. Solar distillation can be used to make saline or brackish water potable. The first recorded instance of this was by 16th century Arab alchemists. A large-scale solar distillation project was first constructed in 1872 in the Chilean mining town of Las Salinas. The plant, which had solar collection area of 4,700 m², could produce up to 22,700 L per day and operated for 40 years.Individual still designs include single-slope, double-slope (or greenhouse type), vertical, conical, inverted absorber, multi-wick, and multiple effect. These stills can operate in passive, active, or hybrid modes. Double-slope stills are the most economical for decentralized domestic purposes, while active multiple effect units are more suitable for large-scale applications. 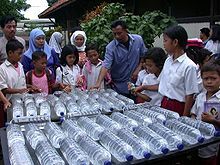 Solar water disinfection (SODIS) involves exposing water-filled plastic polyethylene terephthalate(PET) bottles to sunlight for several hours. Exposure times vary depending on weather and climate from a minimum of six hours to two days during fully overcast conditions. It is recommended by the World Health Organization as a viable method for household water treatment and safe storage. Over two million people in developing countries use this method for their daily drinking water. Solar energy may be used in a water stabilisation pond to treat waste water without chemicals or electricity. A further environmental advantage is that algae grow in such ponds and consumecarbon dioxide in photosynthesis, although algae may produce toxic chemicals that make the water unusable. The Solar Bowl in Auroville, India, concentrates sunlight on a movable receiver to produce steam for cooking. Solar cookers use sunlight for cooking, drying and pasteurization. They can be grouped into three broad categories: box cookers, panel cookers and reflector cookers. The simplest solar cooker is the box cooker first built by Horace de Saussure in 1767. A basic box cooker consists of an insulated container with a transparent lid. It can be used effectively with partially overcast skies and will typically reach temperatures of 90–150 °C. Panel cookers use a reflective panel to direct sunlight onto an insulated container and reach temperatures comparable to box cookers. Reflector cookers use various concentrating geometries (dish, trough, Fresnel mirrors) to focus light on a cooking container. These cookers reach temperatures of 315 °C and above but require direct light to function properly and must be repositioned to track the Sun. The solar bowl is a concentrating technology employed by the Solar Kitchen in Auroville,Pondicherry, India, where a stationary spherical reflector focuses light along a line perpendicular to the sphere's interior surface, and a computer control system moves the receiver to intersect this line. Steam is produced in the receiver at temperatures reaching 150 °C and then used for process heat in the kitchen. A reflector developed by Wolfgang Scheffler in 1986 is used in many solar kitchens. Scheffler reflectors are flexible parabolic dishes that combine aspects of trough and power tower concentrators. Polar tracking is used to follow the Sun's daily course and the curvature of the reflector is adjusted for seasonal variations in the incident angle of sunlight. These reflectors can reach temperatures of 450–650 °C and have a fixed focal point, which simplifies cooking. The world's largest Scheffler reflector system in Abu Road, Rajasthan, India is capable of cooking up to 35,000 meals a day. As of 2008, over 2,000 large Scheffler cookers had been built worldwide. STEP parabolic dishes used for steam production and electrical generation. Solar concentrating technologies such as parabolic dish, trough and Scheffler reflectors can provide process heat for commercial and industrial applications. The first commercial system was the Solar Total Energy Project (STEP) in Shenandoah, Georgia, USA where a field of 114 parabolic dishes provided 50% of the process heating, air conditioning and electrical requirements for a clothing factory. This grid-connected cogeneration system provided 400 kW of electricity plus thermal energy in the form of 401 kW steam and 468 kW chilled water, and had a one hour peak load thermal storage. Evaporation ponds are shallow pools that concentrate dissolved solids through evaporation. The use of evaporation ponds to obtain salt from sea water is one of the oldest applications of solar energy. Modern uses include concentrating brine solutions used in leach mining and removing dissolved solids from waste streams. Clothes lines, clotheshorses, and clothes racks dry clothes through evaporation by wind and sunlight without consuming electricity or gas. In some states of the United States legislation protects the "right to dry" clothes. Unglazed transpired collectors (UTC) are perforated sun-facing walls used for preheating ventilation air. UTCs can raise the incoming air temperature up to 22 °C and deliver outlet temperatures of 45–60 °C. The short payback period of transpired collectors (3 to 12 years) makes them a more cost-effective alternative than glazed collection systems. As of 2003, over 80 systems with a combined collector area of 35,000 m² had been installed worldwide, including an 860 m² collector in Costa Rica used for drying coffee beans and a 1,300 m² collector in Coimbatore, India used for drying marigolds. The PS10 concentrates sunlight from a field of heliostats on a central tower. Commercial CSP plants were first developed in the 1980s, and the 354 MW SEGS CSP installation is the largest solar power plant in the world and is located in the Mojave Desert of California. Other large CSP plants include the Solnova Solar Power Station (150 MW) and theAndasol solar power station (100 MW), both in Spain. The 80 MW Sarnia Photovoltaic Power Plant in Canada, is the world’s largest photovoltaic plant. A solar pond is a pool of salt water (usually 1–2 m deep) that collects and stores solar energy. Solar ponds were first proposed by Dr. Rudolph Bloch in 1948 after he came across reports of a lake in Hungary in which the temperature increased with depth. This effect was due to salts in the lake's water, which created a "density gradient" that prevented convection currents. A prototype was constructed in 1958 on the shores of the Dead Sea near Jerusalem. The pond consisted of layers of water that successively increased from a weak salt solution at the top to a high saltsolution at the bottom. This solar pond was capable of producing temperatures of 90 °C in its bottom layer and had an estimated solar-to-electric efficiency of two percent. Thermoelectric, or "thermovoltaic" devices convert a temperature difference between dissimilar materials into an electric current. First proposed as a method to store solar energy by solar pioneer Mouchout in the 1800s, thermoelectrics reemerged in the Soviet Union during the 1930s. Under the direction of Soviet scientist Abram Ioffe a concentrating system was used to thermoelectrically generate power for a 1 hpengine. Thermogenerators were later used in the US space program as an energy conversion technology for powering deep space missions such as Cassini, Galileo and Viking. Research in this area is focused on raising the efficiency of these devices from 7–8% to 15–20%. Solar chemical processes use solar energy to drive chemical reactions. These processes offset energy that would otherwise come from an alternate source and can convert solar energy into storable and transportable fuels. Solar induced chemical reactions can be divided into thermochemical or photochemical. Hydrogen production technologies been a significant area of solar chemical research since the 1970s. Aside from electrolysis driven by photovoltaic or photochemical cells, several thermochemical processes have also been explored. One such route uses concentrators to split water into oxygen and hydrogen at high temperatures (2300-2600 °C). Another approach uses the heat from solar concentrators to drive the steam reformation of natural gas thereby increasing the overall hydrogen yield compared to conventional reforming methods.Thermochemical cycles characterized by the decomposition and regeneration of reactants present another avenue for hydrogen production. The Solzinc process under development at the Weizmann Institute uses a 1 MW solar furnace to decompose zinc oxide (ZnO) at temperatures above 1200 °C. This initial reaction produces pure zinc, which can subsequently be reacted with water to produce hydrogen. Sandia's Sunshine to Petrol (S2P) technology uses the high temperatures generated by concentrating sunlight along with a zirconia/ferritecatalyst to break down atmospheric carbon dioxide into oxygen and carbon monoxide (CO). The carbon monoxide can then be used to synthesize conventional fuels such as methanol, gasoline and jet fuel. A photogalvanic device is a type of battery in which the cell solution (or equivalent) forms energy-rich chemical intermediates when illuminated. These energy-rich intermediates can potentially be stored and subsequently reacted at the electrodes to produce an electric potential. The ferric-thionine chemical cell is an example of this technology. Photoelectrochemical cells or PECs consist of a semiconductor, typically titanium dioxide or related titanates, immersed in an electrolyte. When the semiconductor is illuminated an electrical potential develops. There are two types of photoelectrochemical cells: photoelectric cells that convert light into electricity and photochemical cells that use light to drive chemical reactions such as electrolysis. A combination thermal/photochemical cell has also been proposed. The Stanford PETE process uses solar thermal energy to raise the temperature of a thermionic metal to about 800C to increase the rate of production of electricity to electrolyse atmospheric CO2 down to carbon or carbon monoxide which can then be used for fuel production, and the waste heat can be used as well. Australia hosts the World Solar Challengewhere solar cars like the Nuna3 race through a 3,021 km (1,877 mi) course from Darwin to Adelaide. Development of a solar powered car has been an engineering goal since the 1980s. The World Solar Challenge is a biannual solar-powered car race, where teams from universities and enterprises compete over 3,021 kilometres (1,877 mi) across central Australia from Darwin toAdelaide. In 1987, when it was founded, the winner's average speed was 67 kilometres per hour (42 mph) and by 2007 the winner's average speed had improved to 90.87 kilometres per hour (56.46 mph). The North American Solar Challenge and the planned South African Solar Challenge are comparable competitions that reflect an international interest in the engineering and development of solar powered vehicles. In 1975, the first practical solar boat was constructed in England. By 1995, passenger boats incorporating PV panels began appearing and are now used extensively. In 1996, Kenichi Horiemade the first solar powered crossing of the Pacific Ocean, and the sun21 catamaran made the first solar powered crossing of the Atlantic Ocean in the winter of 2006–2007. There are plans to circumnavigate the globe in 2010. Helios UAV in solar powered flight. In 1974, the unmanned AstroFlight Sunrise plane made the first solar flight. On 29 April 1979, theSolar Riser made the first flight in a solar powered, fully controlled, man carrying flying machine, reaching an altitude of 40 feet (12 m). In 1980, the Gossamer Penguin made the first piloted flights powered solely by photovoltaics. This was quickly followed by the Solar Challenger which crossed the English Channel in July 1981. In 1990 Eric Raymond in 21 hops flew from California to North Carolina using solar power. Developments then turned back to unmanned aerial vehicles (UAV) with the Pathfinder (1997) and subsequent designs, culminating in the Helios which set the altitude record for a non-rocket-propelled aircraft at 29,524 metres (96,864 ft) in 2001. TheZephyr, developed by BAE Systems, is the latest in a line of record-breaking solar aircraft, making a 54-hour flight in 2007, and month-long flights are envisioned by 2010. The High-altitude airship (HAA) is an unmanned, long-duration, lighter-than-air vehicle using helium gas for lift, and thin film solar cells for power. The United States Department of Defense Missile Defense Agency has contracted Lockheed Martin to construct it to enhance theBallistic Missile Defense System (BMDS). Airships have some advantages for solar-powered flight: they do not require power to remain aloft, and an airship's envelope presents a large area to the Sun. Solar Two's thermal storage system generated electricity during cloudy weather and at night. Solar energy is not available at night, and energy storage is an important issue because modern energy systems usually assume continuous availability of energy. Thermal mass systems can store solar energy in the form of heat at domestically useful temperatures for daily or seasonal durations. Thermal storage systems generally use readily available materials with high specific heat capacities such as water, earth and stone. Well-designed systems can lower peak demand, shift time-of-use to off-peak hours and reduce overall heating and cooling requirements. Phase change materials such as paraffin wax and Glauber's salt are another thermal storage media. These materials are inexpensive, readily available, and can deliver domestically useful temperatures (approximately 64 °C). The "Dover House" (in Dover, Massachusetts) was the first to use a Glauber's salt heating system, in 1948. Solar energy can be stored at high temperatures using molten salts. Salts are an effective storage medium because they are low-cost, have a high specific heat capacity and can deliver heat at temperatures compatible with conventional power systems. The Solar Two used this method of energy storage, allowing it to store 1.44 TJ in its 68 m³ storage tank with an annual storage efficiency of about 99%. Off-grid PV systems have traditionally used rechargeable batteries to store excess electricity. With grid-tied systems, excess electricity can be sent to the transmission grid. Net metering programs give these systems a credit for the electricity they deliver to the grid. This credit offsets electricity provided from the grid when the system cannot meet demand, effectively using the grid as a storage mechanism. Pumped-storage hydroelectricity stores energy in the form of water pumped when energy is available from a lower elevation reservoir to a higher elevation one. The energy is recovered when demand is high by releasing the water to run through a hydroelectric power generator. A parabolic dish and stirling enginesystem, which concentrates sunlight to produce useful solar power. Beginning with the surge in coal use which accompanied the Industrial Revolution, energy consumption has steadily transitioned from wood and biomass to fossil fuels. The early development of solar technologies starting in the 1860s was driven by an expectation that coal would soon become scarce. However development of solar technologies stagnated in the early 20th century in the face of the increasing availability, economy, and utility of coal andpetroleum. Commercial solar water heaters began appearing in the United States in the 1890s. These systems saw increasing use until the 1920s but were gradually replaced by cheaper and more reliable heating fuels. As with photovoltaics, solar water heating attracted renewed attention as a result of the oil crises in the 1970s but interest subsided in the 1980s due to falling petroleum prices. Development in the solar water heating sector progressed steadily throughout the 1990s and growth rates have averaged 20% per year since 1999. Although generally underestimated, solar water heating and cooling is by far the most widely deployed solar technology with an estimated capacity of 154 GW as of 2007.